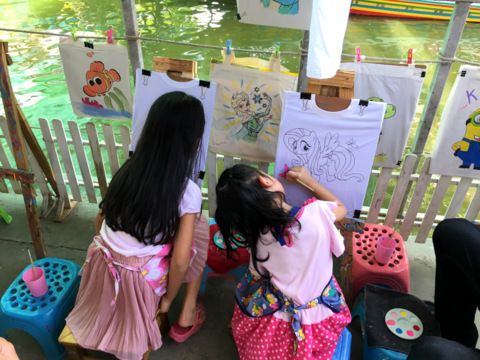 Khlong Lat Mayom floating market in Taling Chan district Bangkok is popular with local residents for its good food, snacks, fresh fruits and vegetables and a canal boat tour of an agricultural area. 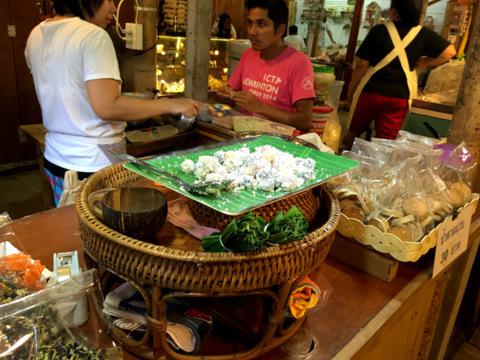 This was actually an old market that has been revived for residents in the communities around to bring their fresh produce or cooked food to sell. 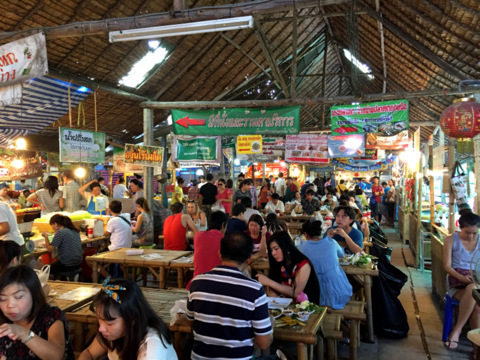 The market has a local atmosphere and is very popular with Bangkok residents during the weekends. 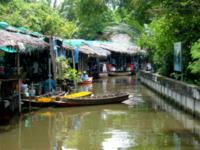 "Talad nam" or floating markets in Thai broadly means a market by the river or canal where water-borne trade is conducted. In the past most communities lived along or near rivers or canals. Residents who had homes by the river or canal opened shops and sold from their shops to the waterside residents, those living nearby brought their goods to set up stalls by the walkways. Boats vendors selling all kinds of goods plied the waterways selling their goods along the way. 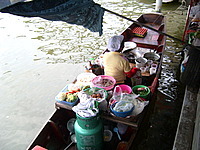 Frequently these boats will gather at a popular location and start a market there. 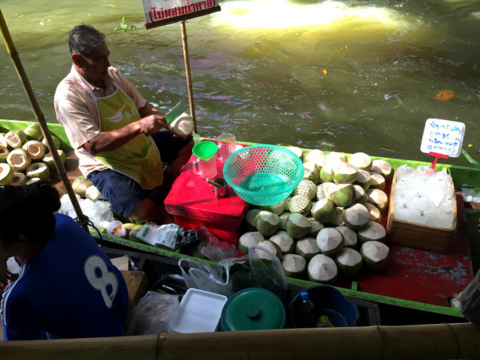 Boat vendors were more numerous then because the waterways were the main thoroughfare. Even the Government Savings Bank has a boat service that serves the waterside residents till today! 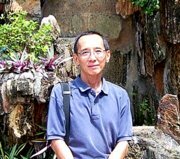 However road development, cheaper and more convenient land transport spelt the end of the boat vendors. Furthermore sluice gates across some canals have blocked the movement of boats to some of these markets further reducing the number of boats. 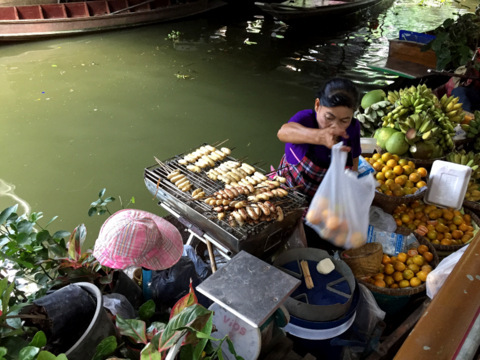 When we think of floating markets in the English context, we imagine the presence of boat vendors. 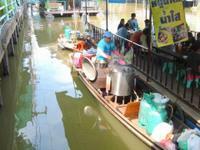 In Thai such waterside markets even if they are without boats today are still called “talad nam”. 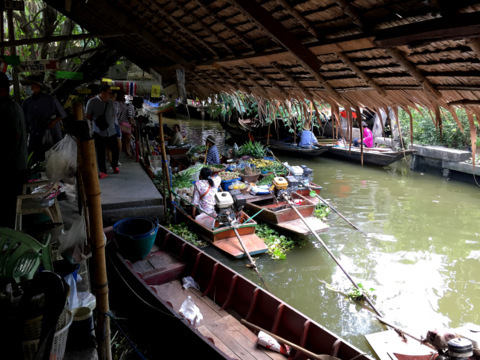 The Khlong Lat Mayom floating market however has a considerable number of boat vendors. 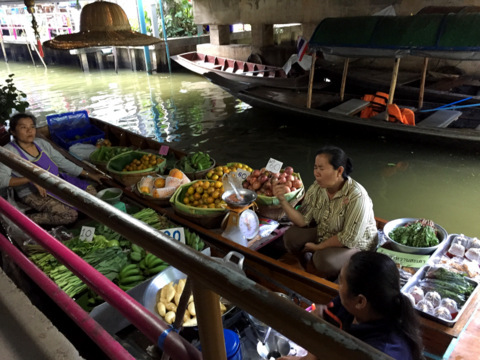 Let’s find out more about this market which is one of three floating markets in Bangkok. 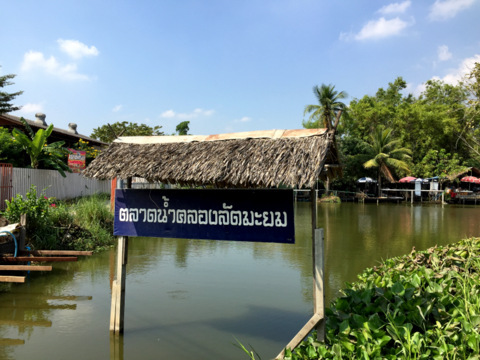 The Khlong (canal) Lat Mayom was dug to link Khlong Bang Ramat (Bang Sai) in the north to Khlong Bang Phrom in the south, a distance of 2.3 km. 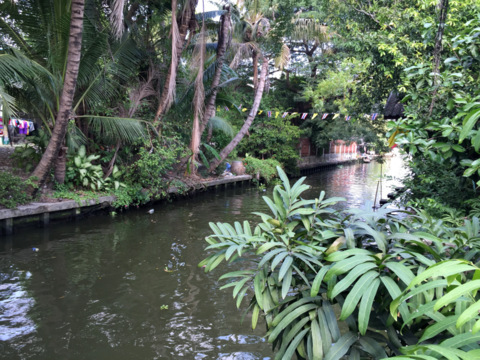 The two longer canals, Khlong Bang Ramat and Khlong Bang Phrom join the Bangkok Noi Canal to the east and lead eventually to the Chao Phraya River. 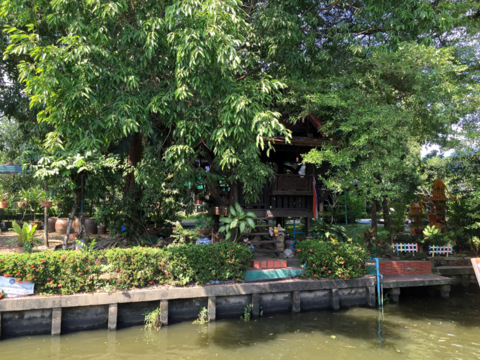 These canals are located in Taling Chan district, an area in western Bangkok that still has several canals and two floating markets; Khlong Lat Mayom and Taling Chan. 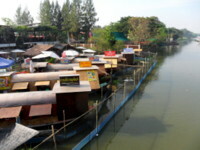 Most of the stalls in this market are located along the east bank of the Lat Mayom Canal that runs in a north-south direction. Bang Ramat Road cuts across the market dividing it in half. 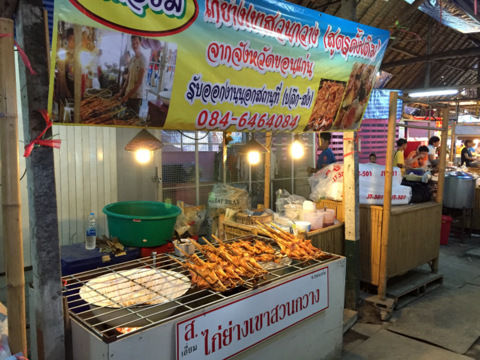 There are a few stalls on the west bank linked by a road bridge and a narrow foot bridge. There isn’t much activity on this side of the canal probably because of the narrow footbridge that only allows a one-way flow of traffic. 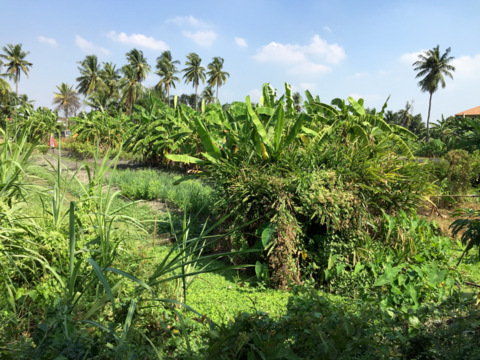 The market is located among houses and orchards of the local community giving the place a very natural atmosphere. Ample parking areas are available on both banks of the canal and in the northern and southern sectors of the market. 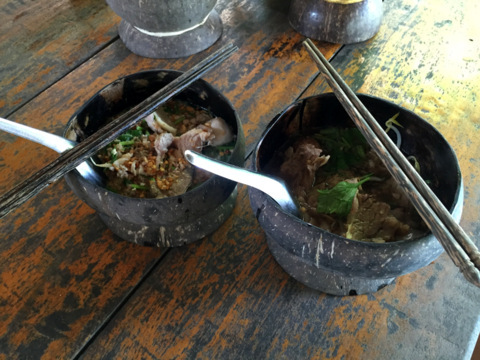 We started our tour in the northern sector and proceeded for something to eat first. 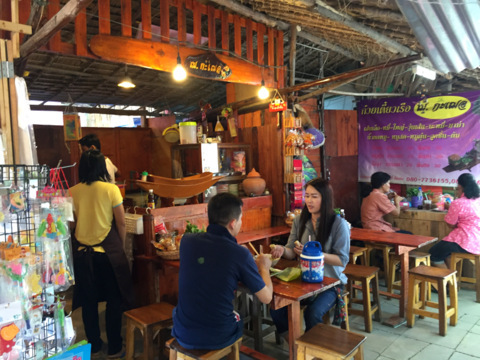 Suan Jiam Ton is a section of the market in the northern sector which includes a quaint noodle shop consisting of wooden stalls, tables and chairs. 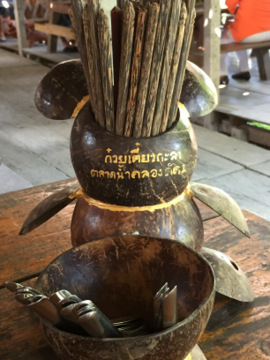 Almost everything is made from wood down to the bowls chopsticks and condiment containers except for the tin spoons. This is the popular "Kwai Teow Ka La" or Ka La Noodles. 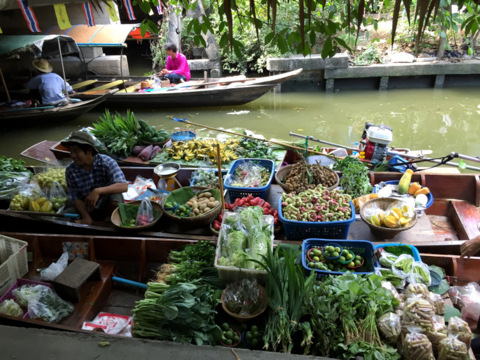 Boat vendors ply the narrow canal that’s about 15 m broad selling cooked food, fresh fruits and vegetables. 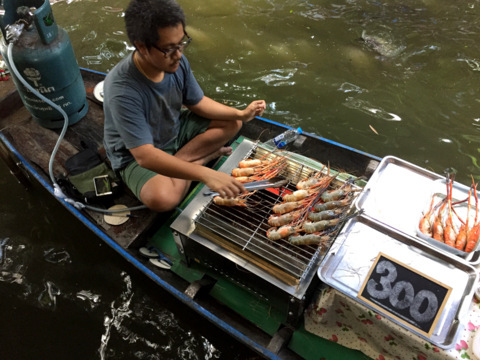 Let’s take a look at the fare provided by the boats vendors on the Khlong Lat Mayom floating market. 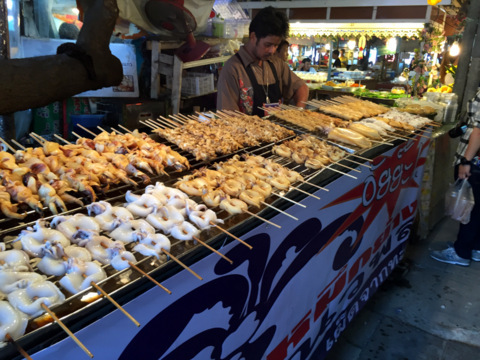 The food stalls on land are equally attractive. 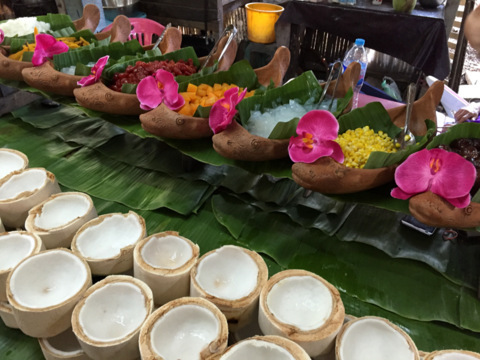 There is a wide range of barbecued meats, seafood, Thai salads and piping hot noodles in various flavours. The deserts section is a joyful sight to behold. 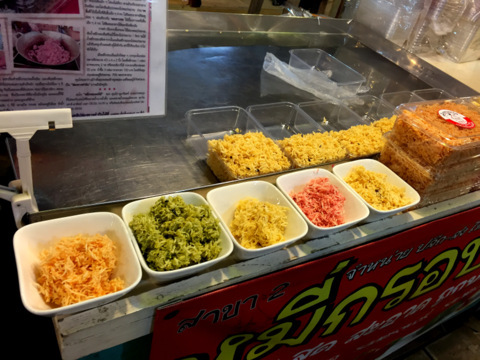 There are numerous types of colourful Thai deserts and even if you can’t taste them all they are simply beautiful to look at. Let’s feast our eyes. 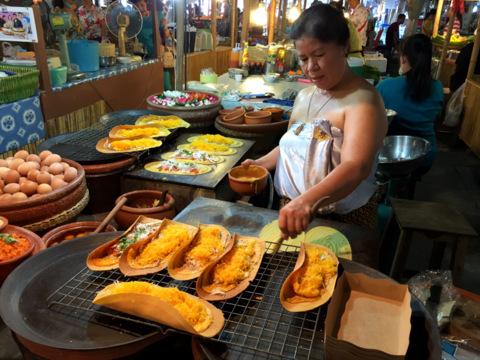 This is our favourite; kanom bueng or Thai crepe. A sweeten flour paste is poured on to a hot plate to make the crust. Making the filling is far more elaborate. The yolk of ducks’ eggs is place in a funnel and slowly released in a zig-zag manner on a pot of boiling sugar water. The yolk solidifies into noodle-like slivers which are fished out with a chopstick. Other flavours are made from crushed prawns and sesame seeds. 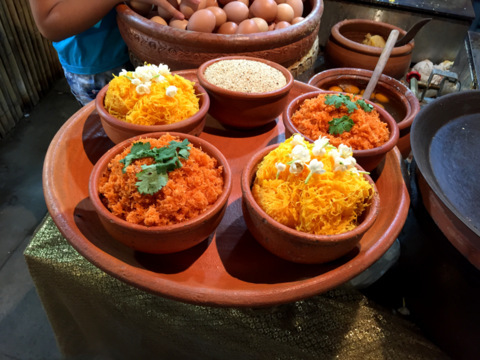 Most of the food stalls in the parts of the market are near the canal banks where visitors can choose to eat by the canal on low tables or on higher tables of normal height. 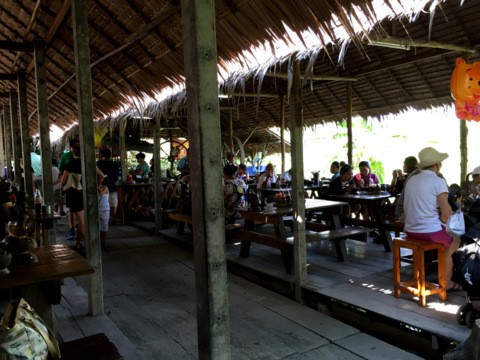 There are plenty of tables and chairs and visitors are free to sit anywhere they like. It’s a local custom to clean up your table after you’ve finished. Litter bins are available. If you are tired, take a coffee break in one of the cafes or have a massage to ease your tired feet. 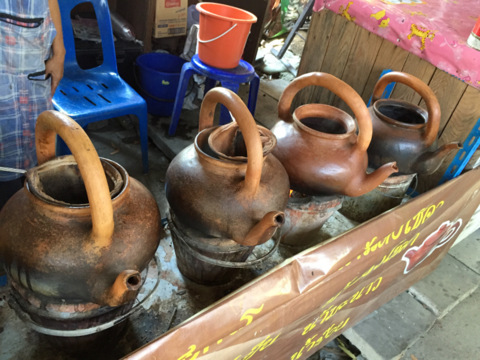 We opted for the traditional Thai coffee brewed in clay pots in a stall on the west bank where it was quieter. 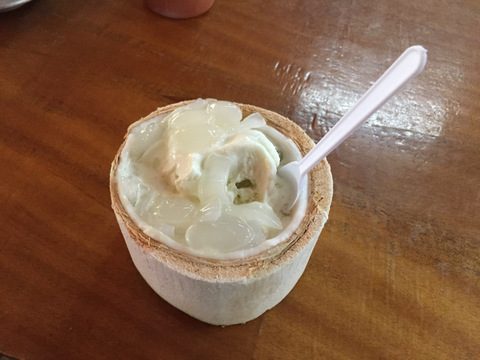 For desert we chose this coconut desert consisting of coconut shavings, ice cream and a choice of two ingredients from the containers lined above. 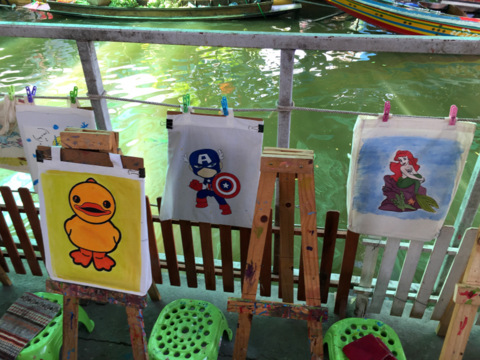 There’s an artists’ corner for budding artists to paint their T shirts. You buy your T shirt that’s already printed with a character. Paints and brushes are provided to fill in your favourite colours. 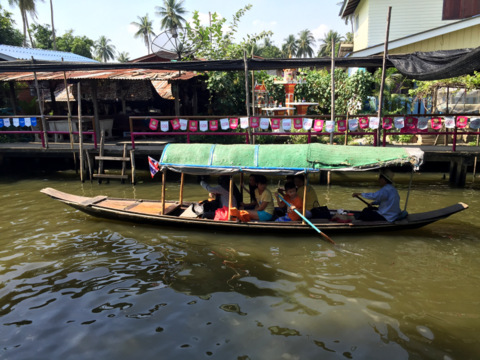 Another activity at this floating market is to take a canal tour on a motor boat or if you prefer a slower pace, a row boat to see the way of life in the area in Bangkok that’s still very agricultural. 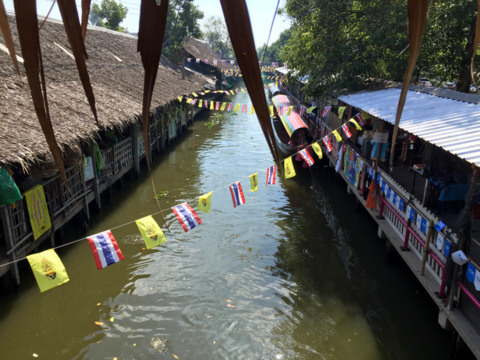 The Lat Mayom floating market is a pleasant way to spend a day away from the congested city centre and see a part of Bangkok where life is still very rustic and peaceful. At the Bang Ramat – Phutthamonton 1 junction you will need to turn left and make a U-turn to get to Bang Ramat Road. 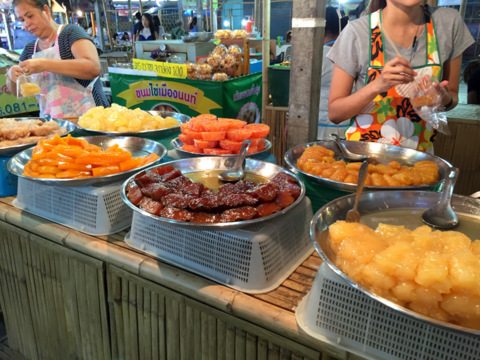 Continue along Bang Ramat Road till you get to the market. 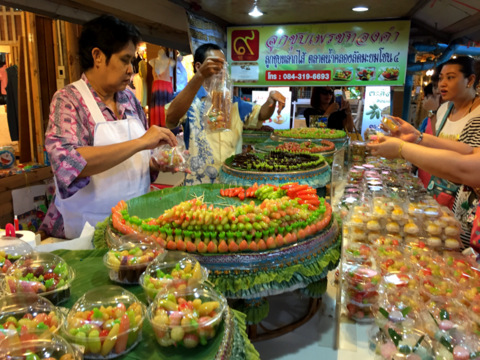 Take the Silom line of the Bangkok skytrain (BTS) to the terminal station at S12 Bang Wa then take a taxi to the market taking the route mentioned above.